If you accidentally open a file with wrong program, you will notice the program used to open the file is added to the recommended program list. The reason is Windows remembers you have used the program to open it once. Once it is added, it will be there forever although it is not the correct program used to open this file. 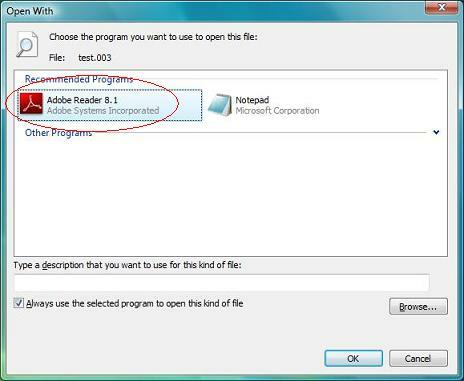 For instance, test.003 is supposed to be opened by using notepad, but if you accidentally open it with Adobe, so you will see Adobe being added to the recommended program list for all files with .003 extension. How to remove the wrong recommended program from the Open With window? Here you can remove it by doing some simple tricks. 1. Navigate to HKEY_CURRENT_USER\Software\Microsoft\Windows\CurrentVersion\Explorer\FileExts\[file extension]\OpenWithList. For example, if you want to delete the wrong recommended program for test.003, then you should look for file with .003 extension. 2. At the right panel, look for the key with value of the wrong program which has been used to open the file, right click on it and choose delete to remove it. For example, delete the key with AcroRd32.exe. Once you have done above steps, you will notice the wrong program is disappeared from the recommended program list. Hopefully this trick will help you to save some of your time while struggling to change it in simple steps.